Parents and students at Secord Public School have had enough. That is the message they want the Toronto District School Board (TDSB) to hear, understand and act on, as conditions at the school are deteriorating and the funding to address the issue does not seem to be a priority. $70 million in funding was frozen after the province showed concern on how the money was being spent. Sheila Cary-Meagher, Ward 16 School Trustee, is disappointed that the funding was frozen and blames it on “micro-management. “Although I will acknowledge we have some problems, the difference between $70 million and zero is significant,” said Cary-Meagher. Recently, the province allowed a portion of the money to be spent on renovations in some schools such as Earl Haig and Swansea – but none was directed to Secord or its neighbouring schools. Secord, along with Parkside, DA Morrison, George Webster and Crescent Town, are feeling the effects of a growing population, implementation of full-day kindergarten, and decaying facilities. Crescent Town now sends fifth graders to George Webster because it has no room for them. Dozens of portables are now the permanent classrooms for many students in these schools. 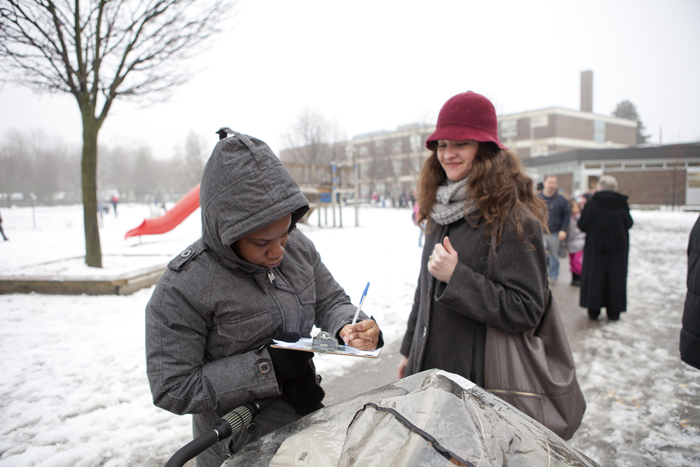 That inspired the parents to mobilize, and on Jan. 28 they gathered at Secord to make the community aware of their needs and collected signatures for a petition urging TDSB to put the schools on a priority list. “The great thing is that all five schools are working together. They’re not elbowing each other out…they’re saying ‘we are a neighbourhood, we need help, and we need you to pay attention’,” said Cary-Meagher. Beaches-East York MPP Michael Prue underlined the importance to put pressure on TDSB to put the funding requirements on the agenda. He explains that without it being a priority of TDSB, he is not able to “fight for it” at the provincial level. “This is a needs community. The schools are bursting at the seams and it’s time we rebuild them,” said Prue. Peter Saros, a parent at Secord and also co-chair of the Parent Council, explained that there is no room in the school for any programs. “The portables here are 20 years old and we’re running 14 classes out of them…we have a food and nutrition program and we don’t even have a kitchen,” he said. “The school is running down, everything is falling apart. They need to upgrade, and not put portables,” said Mandy Pastuch, a parent of two children who attend Secord. Parents and community members attended a TDSB committee meeting on Jan. 30 to express their concerns to trustees, and demand a resolution that is best for the children in this East End neighbourhood.